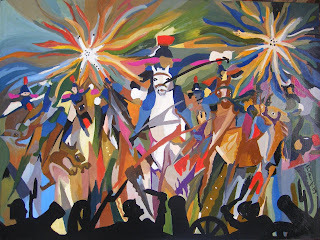 This is another of the series of historical paintings I decided to produce. 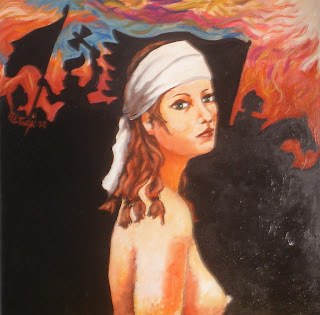 It is a depiction of Mata Hari who for me, may have been framed with espionage on the part of the French General Prosecutor who himself was found to be the spy some time later. Her only fault was that she must have been considerably naive. The style is definitely so and the movement is there to be felt. 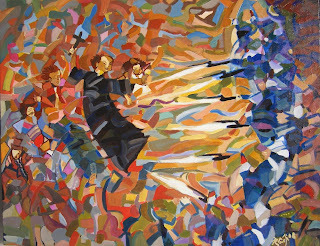 the colours were selected to create movement and contrast. The twisting of the body and its severity in feeling, as I see it, must show the mood of the dancer and its character. Another painting from the collection of historical events. This time it is the funeral of Caesar. It is full of symbolism, movement and despair. These were obviously the result of the murder of this great Roman Dictator who was benevolent to the soldiers who fought with him, hero of the common people of Rome, but enemy of the aristocrats. The 'comic style' is still there as well as 'naive way' of drawing and the show of despair of the wailing women. As part of my collection of paintings in acrylics depicting legends and events in history, I have lately produced this piece. The style is definitely naive' and in a comic style drawing as I have been producing of late. 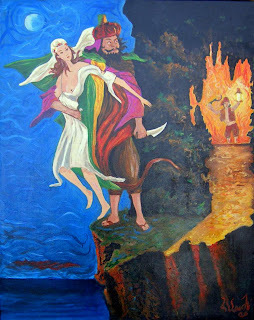 For those who do not know what the legend of Ghar Hessian is one needs to explain that Hessian a Turkish slave is thought to have abducted a beauty who was about to get married and took her to the cave in Birzebbugia by the sea. When her bridegroom and friends came to claim the girl, the Turk with the bride-to-be, jumped from the cave to the sea and no one ever saw them again. But was the girl willing to jump down with him or not? Maybe when she got to know the handsome dark man (Turk) she decided she could not live without him......!!! 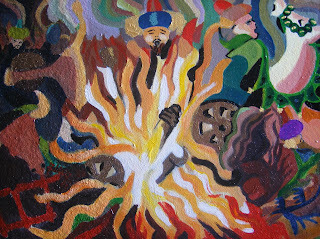 Another series of canvases measuring 100 x 80 cm and this time it depicts the death of Dun Mikiel Xerri with the firing squad by the French. The structure of the painting wanted to make an emphasis on the actual shooting of the firing squad. This is another acrylic of the series measuring 100 x 80 cm. It depicts the charge of the Light Brigade sent to its distruction by stupid generals but also shows the great courage of these soldiers and their horses. The Style is purposely painted to show the battle atmosphere and its distruction. 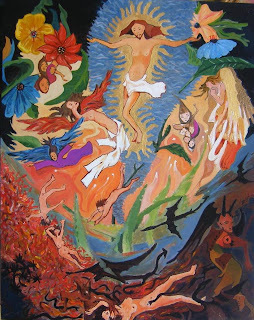 This is a large acrylic 100 cm x 80 cm, and it contents deals with my dreams of heaven and hell in adolesence. Ofcourse it was all the bagage I was spooned all my life till then. The work is a parody and surrealistic approach to the subject. This work have never been exhibited but will be exhibited this year in my forthcoming exhibition in August. 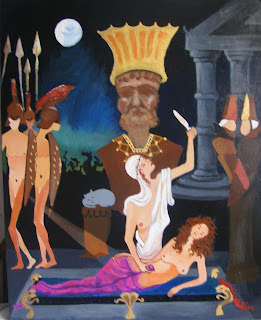 Salome' was a jewish pretty girl whose mission was to cut the poor head of her master. 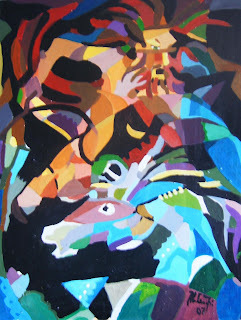 This is an acrylic done in a movement style depicting colours comming from the tube, as we say. It was done late last year and it is also part of the historical series to be exhibited soon next year. 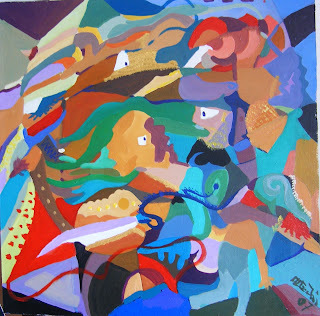 This is the depiction of the attack of the dejma ( a maltese cavalry) on the Mamalucks who first landed at Marsa at the beginning of the Great Siege. 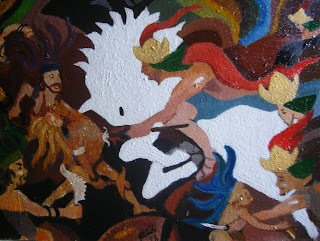 This work in acrylics too, is made on an economical nearly classic style, though the emphasis is on the large white horse which shows violence and power at the impact of the meeting at the battle. This is no ordinary lady. She was the daughter of a Pope who used her to seduce and manage his power over the kingdoms of Italy and even Europe. 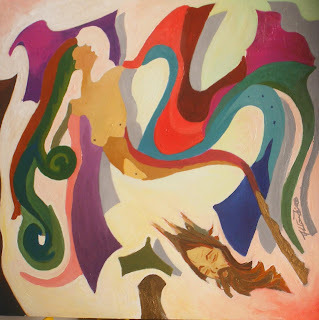 This is an acrylic painting again depicting an incident in the life of Humanity. Herod had percieved that Baby Jesus would be among the Bethlehem children and he decided to kill those of less the two years, to make sure that He is killed. The rampage of killings, Cries of women and those of animals enphacises the grave incident and so does the smolthering colours. 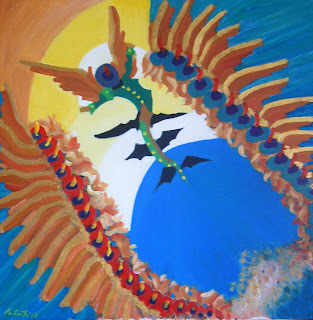 Angels and Archangles are a favourite of my subjects in all media paitings. We have been taught that before the creation of the world, there was a battle between the most fantastic angles for the attention of the Lord. The two opposing sections were led by Archangel Gabriel and the most beautiful of all Archangels, Lucifero. Lucifero's faction lost and here we see him transforming into a weird sort of angel, descending in the abess. 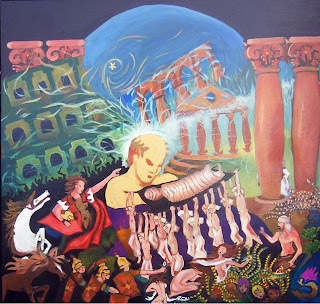 This is a painting in acrylic depicting Alexander on his cruelest mission in establishing 'his' civilization from across the mediteranean to India. The actions of both the Warior Lord, and the screaming horse is obvious. Dark mysterious background depicts the atmosphere that prevailed during these bloody adventures. 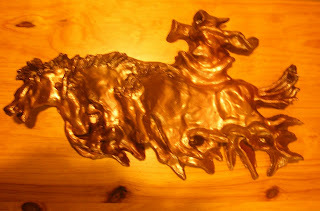 Horses on fire, is a clay work not more than 10'' 18'' . 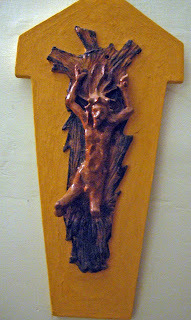 It has been placed on a smooth thick wood which compliment the sculptures action. The sculpture has a mysterious rider with invisible reins which controls the fury of the horses on fire. Bagoas taken from another angle. 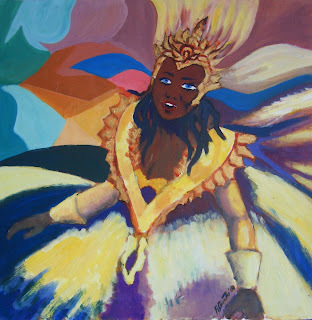 Carnival is an acrylic painting of 30'' x 28'' on wood. 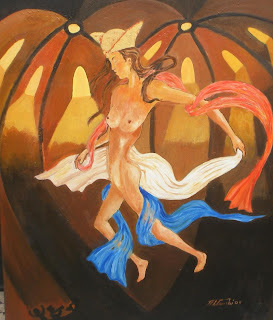 The painting is inspired by the esquisite movement of the dancer's dress in a joyious mood created by carnival. This new series of acrylics will soon be exhibited collectively. The mood is harsh and the show of colours and vibration of movement is obvious. Carnival is a joyious work with a little shade of melanchony in tone. 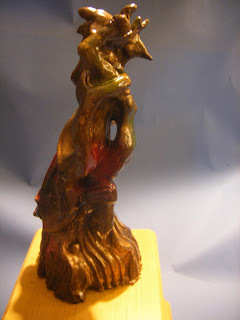 This is one of the latest work in clay. Bagoas, know as the 'boy', because of his slim body and soft dark complexion, was the dancer of Alexander the Great. Some say he was more than that infact he might have even been a butler, a confideant and even a lover of the Great King. The twists and curves of the body denotes action and style of a time when the Grandness of the High King of Babylon was on its optimum level. 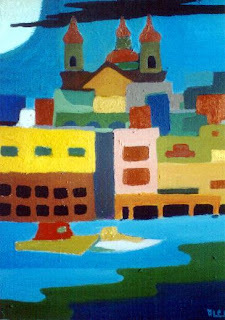 This acrylic painting on cartoons and wood is a representative work of a time when I was keen on working in these materials. 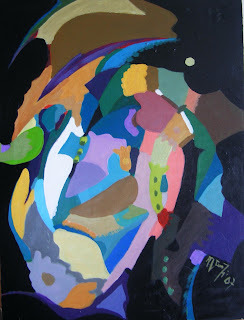 It is a time when this was a new approach to acrylic, although it did not remain long enough. Medium: Acrylic on Wood and cartoons. 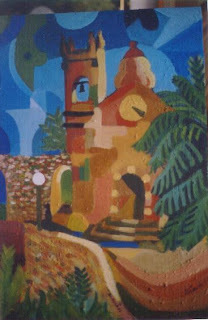 This is an acrylic of the Mellieha Church from the back grounds. Mellieha Santuary is one of the greatest looking temple in Malta. When working in acrylic I concentrate on the simplicity of colour and its design. Shot birds are the most depressing images I detest. Shooting a bird is like killing life. One is destroying the few things that are left for the benefit of man's joy. How sad! 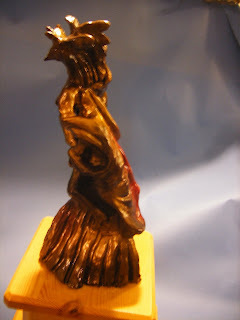 This is a clay work which I did some years back and exhibited afterwards. It is one of my dearest work. This is the portrait of George, my brother when he was thirteen. 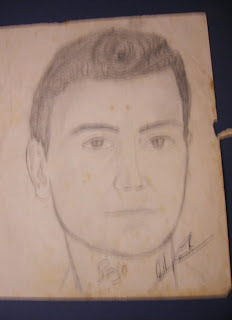 I drew it when in 1963. The conditiion of the drawing is not that good but it is still recognisable. At that time I was keen on drawing many portraits from life and from pictures. 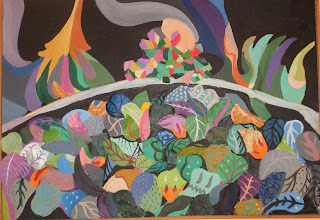 Another still life of a cooking pot and other items I managed to collect for drawing and as an inspiration. This is a play of light, colour and form. Contrast in Dark and light shades with forms forming from patches of colours. 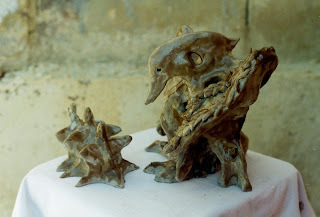 This work in clay is some six years old but is still vivid and mysterious to me and to others. Banishment from the heavens above means total despear and dissillusion. This angel was the most beautiful of them all. Now what will happen to this angel? 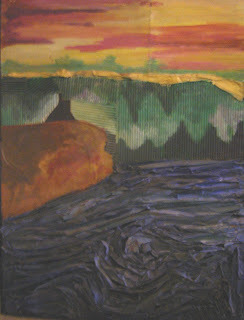 This work is a collage and acrylic piece done some years back, and inspired by a lovely pond that I have seen in Orvieto, Italy. 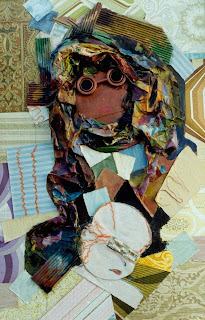 Collage gives depth and character to a work. It will be interesting if I manage to do another series of this work, as I found it most inspiring. 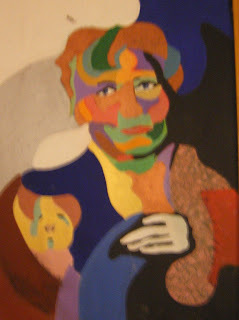 This is the portrait of my mother. It is how I always want to remember her. A woman who though suffered in childhood which left marks on her behaviour all her life, was still full of humour, colour and wise uncompromising counseling. Yes, this is one of my favourites as far as 'arte povera' is concerned. What do one mean by 'arte povera'? It is art done with canny cynicism, trying to show a hidden statement, and using 'poor discarded material' found easily anywhere. How many times did we complain about the environment? How many times did we complain about the artificiality of life as depicted by the media? We complain of hub hazard building, design. We complain of 'plastic' ideas, whitewash talk, and rubbish everywhere. I imagine all this in this image of two innocent persons, a mother and a child, who are the victims of this 'crazy' world of ours. By the way, this work was given to the Museum of Fine Arts in the eighties and I hope that when a Museum of Modern Art is opened in a dreamy future, this work will give its 'meaning' to the public again. Will I still be alive? adding a baggage of personal thoughts and feelings, this product has been exhibited a few years back.